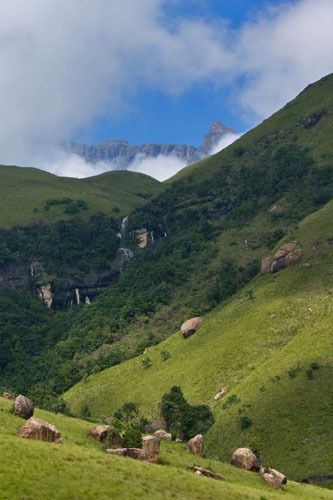 This was to be my last day in the KwaZulu-Natal Drakensberg and it started off much as yesterday had. The cloud was low and to add to my problems I also found out that the pass to take cars up to the Little Berg was closed. This meant that I had to start my hiking at around 1400m rather than the 1900m I had hoped to do. Although not raining, the mist had made every blade of grass a miniature drainpipe that poured water down my legs and into my boots as I passed. Within a short time my feet squelched with every step I took. Even when I waded through a river up to my knees, my boots felt no wetter at the end of it. But as I climbed up out of the valley, so the clouds did not so much lift as part every now and then, offering me fleeting views of the high escarpment beyond. My aim today was to find the Cathedral Peak poker, K. evansii, but the locality details I had were sketchy to say the least (Cathedral Peak Catchment was as good as it got). 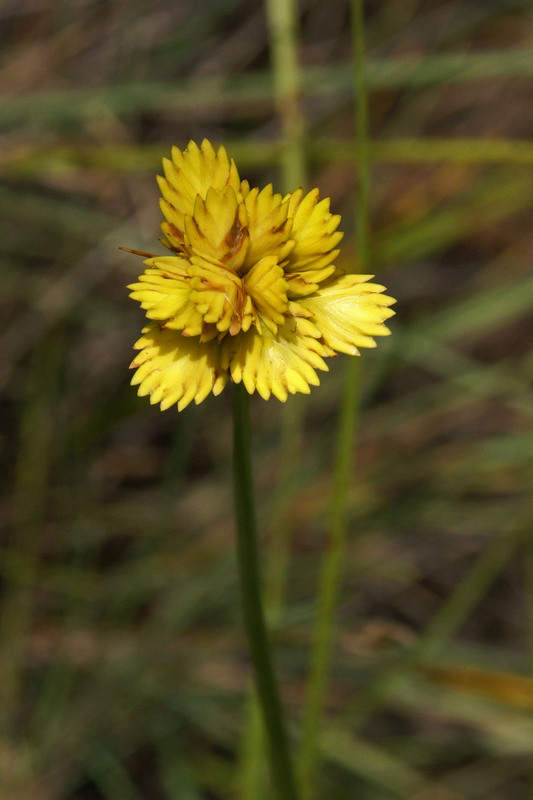 The species looks superficially like K. triangularis, but is unique in the genus for the shortness of its stamens. These do not even reach halfway along the tube, whereas in all other pokers the stamens come nearly to the end or stick out of the tube. Hopes were raised along the way as I came across plants of K. triangularis (or was it K. angustifolia again? ), but closer examination revealed long stamens. As I climbed, I also came across a new species, K. porphyrantha, a rather chubby flowered-species, as well as more K. ichopensis. Having climbed almost 1000m to the base of the rock known as The Camel, and with the mist starting to swirl around, I rounded one last corner before turning back. 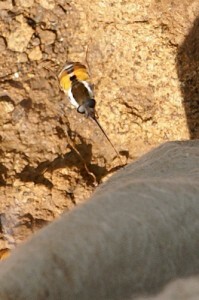 To my amazement, there was a small orange poker that looked different to the ones I had seen on my ascent. 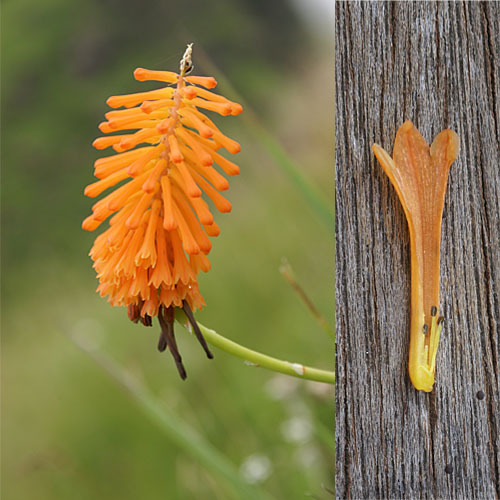 Closer examination showed exceptionally short stamens and there was no doubting that I had found the Cathedral Peak poker, K. evansii. It was a long return from there but one filled with great satisfaction at having tracked down one of the rarest pokers in the Drakensberg. I may not have seen the escarpment of the Drakensberg in its full glory, but I did find a gem within the shadows of those imposing cliffs. Plant of the day: Cyprerus sphaerocephalus, yellow sedge. One does not normally think of sedges being colourful, but this species is quite commonly found in the grasslands of the Drakensberg and is definitely eye-catching. Bug of the day: These flies were like buzzing hypodermic syringes. Their proboscis was almost twice the length of their body. As soon as I stopped they buzzed around my legs looking for a place to insert it. Needless to say, I only hung around long enough to take this rather fuzzy photo before moving on again. 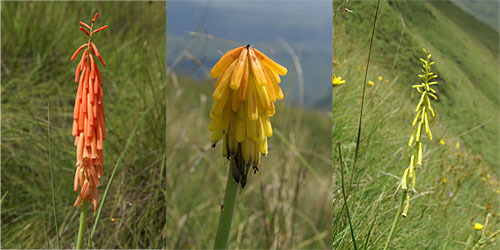 Cathedral Peak, Cyperus, Drakensberg, Kniphofia, Kniphofia evansii, Kniphofia ichopensis. Bookmark.